If you’d like to add a patio to your back yard, using interlocking stone pavers is an easy and attractive way to do it. Pavers are set on a dry bed of sand and the project doesn't require any special skills. Start out by deciding where and how big you want your new patio to be. Measure the length and width, and multiply the two numbers together to determine total square footage. Now take a trip to your local home improvement or landscaping retailer--calculator in hand--and browse the types of interlocking patio stones that they have available. There’s wide variety of colors, shapes and sizes. You can even mix and match stones to create borders or designs. Put that calculator to work figuring out how many stone pavers you need to fit your square footage. Be sure to buy 5 to 10 percent over what you calculate to allow for cutting and breakage. 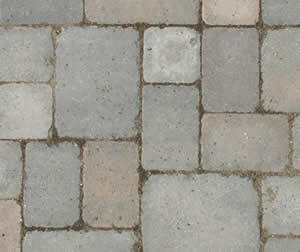 Plus, you’ll have pavers that match in case your retailer stops carrying your particular style! Next, clear the area where the pavers will be installed. Ordinarily, installation should have the surface of the pavers flush with the surrounding ground or slightly higher. However, a raised bed installation is also possible by building a perimeter base. One method to create a raised base is to pour a concrete base slightly recessed into the ground. The area within the perimeter can then be filled with stone, gravel and sand to the desired height. If installing flush with the ground level, use a shovel to mark out the area to be excavated. Dig the foundation deep enough to accommodate the thickness of the pavers plus the base material you will put down (about 1 inch in this case). The base must also be sloped slightly away from the house to allow for proper water runoff. The slope should be about one inch for every four to eight feet. So if your patio extends 10 feet from your home, a minimum slope of 1.25 inches should be used. Don't worry too much about digging too deep or about the slope now, you can get it just right when you add the sand base. In order to keep a constant depth and slope, place stakes at the high and low point of the patio. Tie a string to each stake at the desired finished height. Use a line level to achieve the desired slope. Then to check the depth, cut a piece a string to twice as long as the desired depth. Fold the piece of string in half and hang it over the staked string. Slide the string along the length to check for minimum depth. Many pavers are capable bearing the weight of vehicles, but be sure to check the manufacturer's specifications for the type select. If heavy loads will be placed upon your pavers, a deeper sub-base will be required to prevent depressions from forming. Now, build a frame around the perimeter of the cleared area using aluminum edging or treated lumber; install stakes intermittently around the frame to secure it. A frame keeps the pavers in place over time, plus provides a barrier to keep weeds out of the patio area. A frame also provides stronger overall structure and lends a finished look. Pour about one inch of sand throughout the entire area. If you take the time to level your frame in the previous step, you can use them as a guide for leveling the sand. Cut a 2x6 so that it can ride on the tops of the frame. Then notch the ends by an amount equal to the thickness of the pavers. When you set the 2x6 on the frame, it will smooth the sand to just the right height for the pavers. The sand should be tamped down to compact it. Additional sand may need to be added to provide the proper height. Spray a very fine mist of water over the sand. Allow the water to rain down gently to avoid moving the sand. Now it’s time to lay the stones. Start in a corner and work outward. Be careful not to scoot the stones sideways in the sand, as you’ll push away sand and create a low spot. Rather, place them in straight downward. A rubber mallet is useful for tapping the pavers into place. To cut stones, you can use a mason's chisel and a small sledge hammer or they can be cut with masonry saw or a circular saw fitted with a masonry blade. Follow the instructions by the tools manufacturer and choose a blade specifically designed for the type material being cut. Always wear eye protection. Once the stones are placed, pour sand over them and sweep it into the joints. Gently tap the pavers with a mallet to help the sand fill the voids. Continue adding sand until all the joints are filled. Sweep away excess sand and lightly wet down the entire area. Do not use cement or mortar to fill the joints. Sand will lock them pavers in place, but will allow removal should the need arise. Now you have an attractive seating area, which accents your landscaping and provides a place for entertaining guests! It’s time to break out the barbecue grill!